Small blue and white enameled pin promoting Prohibition. Designed by the Van Deusen Advertising Company of Kansas City, Missouri, and made by Geraghty & Company of Chicago, Illinois. 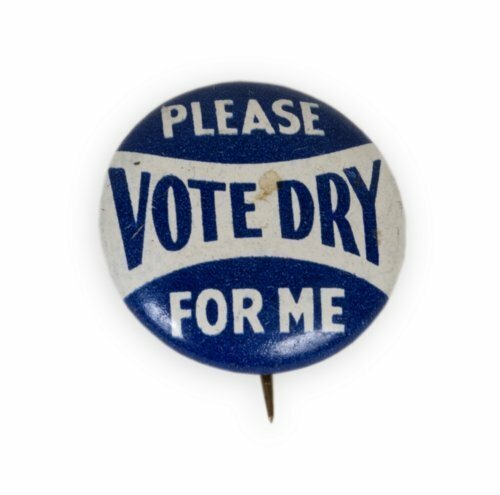 The button probably was used during the 1948 campaign to retain Prohibition in Kansas. Starting in 1880, Kansas established some of the most restrictive liquor laws in the nation. These laws were maintained even after the repeal of federal Prohibition. In 1948, Prohibition ended in Kansas and individual counties were allowed to determine if alcohol would be permitted. Counties allowing alcohol were referred to as "wet" and counties restricting alcohol were called "dry."